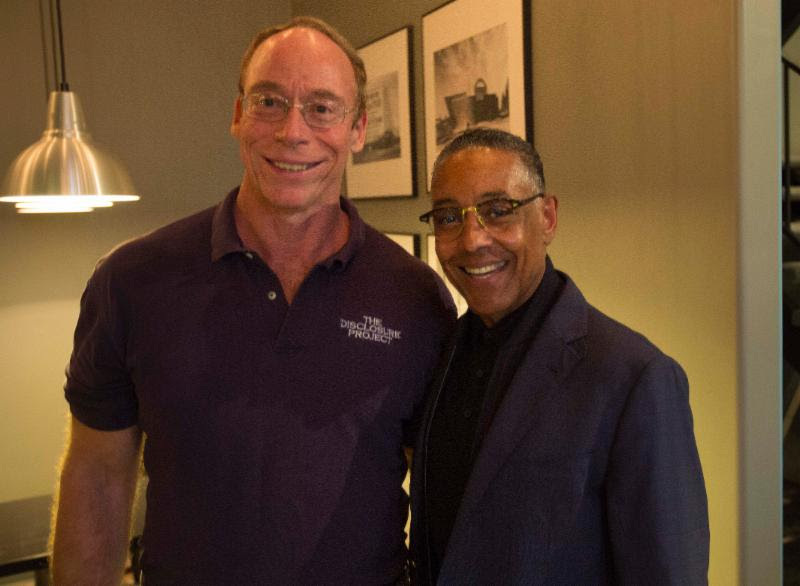 Dr. Greer and Giancarlo Esposito who did the narration for the film. „Dr. Steven Greer’s new documentary „UNACKNOWLEDGED“ that presents brand new, top-secret evidence supporting Extraterrestrial contact including witness testimony, classified documents, and UFO footage while also exploring the consequences of ruthlessly enforcing such secrecy. Do not miss this historic opportunity to attend the world premiere in Los Angeles at the Regal Premiere Theater at LA Live! Red carpet with celebrities and Dr. Greer – 6:45pm-7:30pm. Presentation by Dr. Greer at 7:30pm. Movie begins at 8pm until 9:45pm. After Party 10:15 pm -midnight. April 24, 2017 is the FIRST showing of the film to the public! Digital viewing will be available May 9th. You will be notified of the afterparty venue at the theater. Includes: VIP seating, spend time on the Red Carpet with Dr. Greer and be a part of the Red Carpet excitement with media and stars, receive a book and poster signed by Dr. Greer and attend the exclusive afterparty following the showing of the film. For all ticket options click here. You must purchase a ticket in advance. There will be NO ticket sales at the door because of Regal LA Live rules.